Tip: A slow cooker saves time and money, and will help you keep your new year’s resolution to cook more nutritious family meals at home. Are you too busy or exhausted at the end of your day to make a home-cooked meal? Do you have trouble sticking to your food budget? It is time to dust off your slow cooker! This humble appliance will make feeding your family nutritious, home-cooked meals easier and more economical. By giving you the freedom to prep ahead of time and doing the cooking for you, the slow cooker delivers a hot, one-pot meal that is ready to serve when your family returns home tired and hungry. Most slow cooker recipes require minimal preparation before you throw everything together and let the slow cooker work its magic. Mornings are busy, harried times, so prep your ingredients the night before and store them in the fridge overnight. Place your ingredients in the slow cooker in the morning, turn it on before you leave and dinner will be waiting for you when you return. Slow cookers excel at cooking food at low heat over long periods of time, which is perfect for tenderizing even the toughest meats. Save money by choosing less desirable cuts and the slow cooker will transform them into ‘fall-off-the-bone’ meats that taste more like premium cuts. Slow cookers are also excellent for cooking dry beans, which cost a fraction of canned beans. Cook up large batches and store them in the freezer; reheat whenever you need a quick meal. Slow cooking saves time on the tail end of your meal as well. Slow cooker meals are usually cooked in only one or two pans, making clean up quick and easy, and leaving more time to relax at the end of your busy day. Brown the meat in a separate pan before adding it to the slow cooker. Deglaze the browning pan and add the brown bits to your slow cooker – they are loaded with flavor. Fatty meats are tastier, but trim the fat and drain after browning to avoid excess fat in your pot. Slow cookers are perfect for experimenting with different ingredients and using up the aging raw veggies in your fridge. Root veggies work particularly well. Place these on the bottom, underneath the meat. And don’t overcrowd, which could interfere with proper cooking. 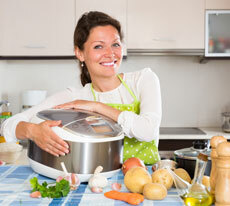 Slow cookers work by trapping water and maintaining a steady temperature. When you open the lid, heat escapes and you lose moisture, increasing your cooking time by 15 to 20 minutes. Add fresh herbs at the end of the cooking process to bring the flavors together. Dairy should be added about 10 minutes before finishing to avoid separation. When your return home from a long day to the smell of a delicious home-cooked meal waiting for you, you will love the way you feel!